Turn right at Market Street. Follow Market Street for 6 blocks until you're at the 4-way stop with Owen's on your right and USPS on your left. Go one more block and turn left onto Union Street. There is an alley to circle around the building for the drop-off door, or you may park in front to come inside. Turn left at Winona Avenue. Follow Winona Avenue 4 blocks and take a right on Union Street. 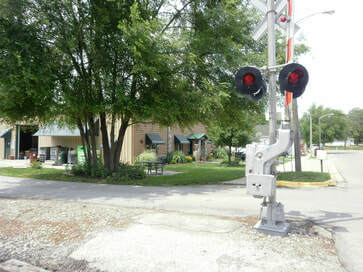 Come up over the railroad tracks, you'll see our building on the left. There is an alley just past the tracks where you can turn in for the warehouse door or the drop-off locations in the back. View from Union Street looking at the south side drop-off door! On the south side of the building there is a door where you can pull up to drop off household chemicals, electronics, paints, batteries, fluorescent lights, etc. During business hours the door will be open and there will be a warehouse technician available to help you. Oil & fluid containers are available 24 hours a day for drop-off. They are also located on the south side of the building.